Text Engine CEO’s Volunteer Program Profiled by Los Angeles LGBT Center – Text Engine Consulting, Inc. 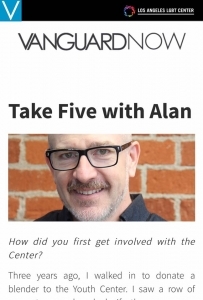 Text Engine CEO Alan Reade was profiled as a “Take Five” in the Los Angeles LGBT Center’s Vanguard Now magazine for his volunteer speaker program for LGBT youth. If you’d like to speak as part of the volunteer program, please navigate to this page.